Note: Unfortunately the practices governing the creation of abbreviations and acronyms in the Irish language have never been formerly codified with considerable variations and changes taking place over the last century and more (see a Scottish example of regulation here). Presently Irish tends to use rules closer to the English language than more traditional forms. So for example the word na would rarely be abbreviated in historic Irish acronyms and likewise the eclipsis would normally be shown. This can be seen in the titles Cumann na mBan (CnamB), Raidio na Gaeltachta (RnaG), Teilifís na Gaeilge (TnaG), etc. However lately this is becoming rarer with Irish government translators abbreviating the name of the European Parliament in the Irish language, Parlaimint na hEorpa, as both PnaE and PE. It can also be seen in the acronym for the Office of Public Works, Oifig na nOibreacha Poiblí or OOP, Cumann Croise Deirge na hÉireann or CCDÉ, Rialacháin Óglaigh na hÉireann or RÓÉ and Óglaigh Náisiúnta na hÉireann or ÓNÉ. Since it is still relatively common to find the retention of na in some historical titles I have kept this in the acronyms below. Alternative versions are shown in the square brackets. Cumann na nÉireannach Aontaithe “Association of the United Irish”, the Irish language equivalent of the English term “Society of the United Irishmen”. Abbreviates as CnaÉA [CÉA] (“SUI”). Na hÉireannaigh Aontaithe “The United Irish”, the Irish language equivalent of the English term “The United Irishmen”. Abbreviates as ÉA (“UI”). Na hÉireannaigh Óga “The Young Irish”, the Irish language equivalent of the English term “The Young Irelanders”. Abbreviates as ÉÓ (“YI”). Éire Óg “Young Ireland”, the Irish language equivalent of the English term “Young Ireland”. Abbreviates as ÉÓ (“YI”). Cónaidhm na hÉireann “the Confederation of Ireland”, the Irish language equivalent of the English term “The Irish Confederation”. Abbreviates as CnaÉ [CÉ] (“IC”). Bráithreachas Phoblacht na hÉireann “Brotherhood of the Republic of Ireland”, the Irish language equivalent of the English term “Irish Republican Brotherhood”. Abbreviates as BPnaÉ [BPÉ] (“IRB”). Bráithreachas na Poblachta “the Brotherhood of the Republic”, alternative for the above. Abbreviates as BnaP [BP]. Bráithreachas na bhFíníní “Brotherhood of the Fenians”, the Irish language equivalent of the English term “Fenian Brotherhood”. Abbreviates as BnaF [BF] (“FB”). Na Fíníní “The Fenians”, alternative for the above. Abbreviates as NF. Clann na nGael “Family of the Irish”, the Irish language modernisation of the earlier term Clan na Gael. Abbreviates as CnaG [CG] (“CNG”). (Na) Fianna Éireann “(The) Warrior-Hunter Bands of Ireland” (earlier and idiomatically “Soldiers/Warriors of Ireland”), the Irish language equivalent of the English term “Irish National Boy Scouts”. Abbreviates as (N)FÉ. See Na Fianna. Iníonacha na hÉireann “the Daughters of Ireland”. Abbreviates as InaÉ [IÉ]. Cumann na mBan “the Association of Women”, the Irish language equivalent of the English term “Irishwomen’s Council”. Abbreviates as CnaB [CB]. Cumann na Saoirse “the Association of Freedom”, the Irish language equivalent of the English term “Freedom Club”. Abbreviates as CnaS [CS]. Óglaigh na hÉireann “the (Military) Volunteers of Ireland”, the Irish language equivalent of the English term “Irish Volunteers”. Abbreviates as ÓnaÉ [ÓÉ] (“IV”). Óglaigh Náisiúnta na hÉireann “the National (Military) Volunteers of Ireland”, the Irish language equivalent of the English term “Irish National Volunteers”. Abbreviates as ÓNnaÉ [ÓNÉ] (“INV”). Arm Cathartha na hÉireann “the Citizen Army of Ireland”, the Irish language equivalent of the English term “Irish Citizen Army”. Abbreviates as ACnaÉ [ACÉ] (“ICA”). Arm Poblachtach na hÉireann “the Republican Army of Ireland”, the Irish language equivalent of the English term “Irish Republican Army”. Abbreviates as APnaÉ [APÉ] (“IRA”). Arm Náisiúnta na hÉireann “the National Army of Ireland”, the Irish language equivalent of the English term “Irish National Army”. Abbreviates as ANnaÉ [ANÉ] (“INA”). Sean-Arm Poblachtach na hÉireann “the Republican Old Army of Ireland”, the Irish language equivalent of the English term “Old Irish Republican Army”. Abbreviates as Sean-APnaÉ [S-APÉ] (“Old IRA”). Arm Saoirse Náisiúnta na hÉireann “National Freedom Army of Ireland”, the Irish language equivalent of the English term “Irish National Liberation Army”. Abbreviates as ASNnaÉ [ASNÉ] (“INLA”). Saor Uladh “Free Ulster”. Abbreviates as SU. Saor Éire “Free Ireland”. Abbreviates as SÉ. Saoirse na hÉireann “the Freedom of Ireland”. Abbreviates as SnaÉ [SÉ]. Arm Poblachtach Shealadach na hÉireann “the Provisional Republican Army of Ireland”, the Irish language equivalent of the English term “Provisional Irish Republican Army”. Abbreviates as APSnaÉ [APSÉ] (“PIRA”). Na Sealadaigh “The Provisionals”, alternative for the above. Arm Poblachtach Oifigiúil na hÉireann “the Official Republican Army of Ireland”, the Irish language equivalent of the English term “Official Irish Republican Army”. Abbreviates as APOnaÉ [APOÉ] (“OIRA”). Arm Poblachtach Leanúnach na hÉireann “the Continuity Republican Army of Ireland”, the Irish language equivalent of the English term “Continuity Irish Republican Army”. Abbreviates as APLnaÉ [APLÉ] (“CIRA”). Fíor-Arm Poblachtach na hÉireann “the Republican True Army of Ireland”, the Irish language equivalent of the English term “Real Irish Republican Army”. Abbreviates as Fíor-APnaÉ [F-APÉ] (“RIRA”). Fórsaí Cosanta na hÉireann “the Defence Forces of Ireland”, the Irish language equivalent of the English term “Irish Defence Forces” or “Defence Forces Ireland”. Abbreviates as FCnaÉ [FCÉ] (“IDF” or “DFI”). Sciathán Fiannóglaigh an Airm “Rangers’ Wing of the Army”, the Irish language equivalent of the English term “Army Rangers’ Wing”. Abbreviates as SFA (“ARW”). Óglach “(Military) Volunteer”. Plural Óglaigh. Sinn Féin “(We) Ourselves”. Abbreviates as SF. Páirtí Poblachtach Sóisalach na hÉireann “the Socialist Republican Party of Ireland”, the Irish language equivalent of the English term “Irish Republican Socialist Party”. Abbreviates as PPSnaÉ [PPSÉ] (“IRSP”). Phoblachtáigh do Aontiú “Republicans for Unity”, the Irish language equivalent of the English term “Republican Network for Unity”. Abbreviates as PA (“RNU”). Poblacht na hÉireann “Republic of Ireland”, the Irish language equivalent of the English term “Republic of Ireland” or “Irish Republic””. Abbreviates as PnaÉ [PÉ] (“ROI” or “IR”). Forógra na Poblachta “Proclamation of the Republic”, the Irish language equivalent of the English term “Proclamation of the Irish Republic”. Abbreviates as FnaP [FP] (“PIR”). Rialtas na hÉireann “Government of Ireland”. Abbreviates as RnaÉ [RÉ]. Rialtas Sealadach Phoblacht na hÉireann “Provisional Government of the Republic of Ireland”. Abbreviates as RSPnaÉ [RSPÉ]. Rialtas Sealadach na hÉireann “Provisional Government of Ireland”. Abbreviates as RSnaÉ [RSÉ]. Éirí Amach na Cásca “the Rising Out of Easter”, the Irish language equivalent of the English term “Easter Rising”. In PDF format here is the official Foclóir Béarla–Gaeilge de Théarmaí Míleata agus de Théarmaí Gaolmhara (English–Irish Dictionary of Military and Related Terms), 2007, as published by Ireland’s Department of Defence. 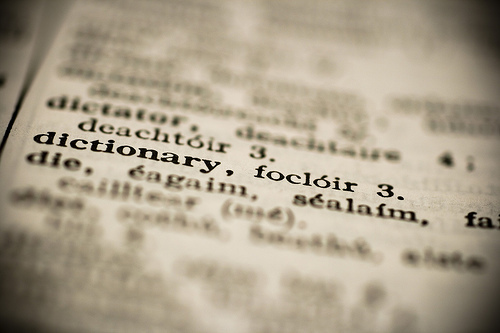 Ireland’s official on-line New English-Irish Dictionary, Foclóir. Ireland’s official on-line Dictionary and Language Library, Breis Foclóir, a companion to the New English-Irish Dictionary project. Ireland’s official on-line National Terminology Database for Irish, Focal. On-line version of Foclóir Gaedhilge agus Béarla – Foclóir Uí Dhuinnín, 1927 edition (longer). On-line version of Foclóir Gaedhilge agus Béarla – Foclóir Uí Dhuinnín, 1904 edition (shorter). The European Union’s drafting and translations page for Irish with on-line resources. For more Irish language links the website Scríobh is an excellent place to start. UPDATE: Thanks to everyone who contacted me in relation to this post, including Maitiú, Pádraig, JP, Louise and Eoin. Your corrections and suggestions have been used with gratitude.